to Build a Big Business? If They Say No Just Say NEXT! is John's sequel to his international bestseller, Reject Me, I Love It! It teaches distributors how to develop the "Some Will, Some Won't, So What NEXT! " attitude they need to build the business. It shows people how to have compassion for everyone, including those who say no, so they don't sever any relationships, which could lead to possible yeses later. Written exclusively for people building a business, it can help them all, those who are new or discouraged, and even seasoned pros who just need a boost to keep on going. ● This exciting new book helps business builders understand the "numbers game." simply to keep going through the numbers: SW, SW, SW, NEXT! noes, so they can persist until they succeed. there and build their businesses, regardless of the answers. 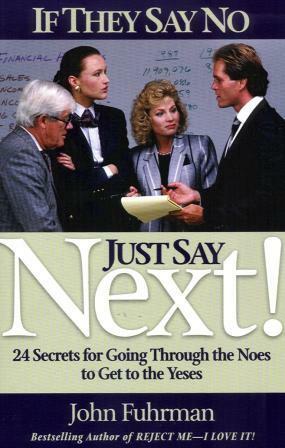 This book teaches people to stay focused and to keep driving toward their dreams, no matter how many noes they may get!